If you like a kick to your curry, add both tablespoons of the Thai curry paste, or just the one if you prefer it mild. 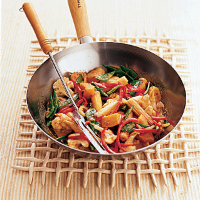 Heat the oil in a large, non-stick pan or wok and add the onion, squash and baby corn. Fry over a high heat for 2-3 minutes. Stir in the red Thai curry paste and coconut milk, cover and simmer over a low heat for about 10 minutes. Add the cauliflower to the pan and return to the boil. Cover and continue to cook for a further 10 minutes, until all the vegetables are just tender. Slice the mangetout in half lengthways and add to the pan with the red pepper. Mix the cornflour with 1-2 tablespoons cold water, the lime juice and fish sauce, stir into the pan and return to the boil for 2-3 minutes. Season to taste. Serve in bowls, with Thai fragrant rice and prawn crackers. Cook up to the end of Step 2. Allow to cool then freeze in an airtight container for up to 1 month. Thaw overnight in the fridge then place in a large, non-stick pan or wok and continue cooking from Step 3.